The main access to BACHLEDKA Ski & Sun is from Bachledova Valley (Bachledova Valley 702, Ždiar), it is a turn from the main road between Ždiar and Tatranska Basin. The way is well marked, watch the information boards that guide visitors. The area is also accessible from the village of Malá Franková, where there is a parking lot with a capacity of about 100 cars directly under the Furmanec ski slope. The 2 km long asphalt road leads from the center of the village. There are traffic signs and advertising signs directing visitors to the parking lot, the road starts at the church in the middle of the village. The arrival is also possible from Jezerko, where there is a smaller parking lot. The road is narrow, be careful when you arrive. If possible, use the Skibus service. Do not forget snow chains in winter, as the mountain roads can be difficult to navigate due to the fact that there are a lot of national parks in the proximity and the winter maintenance is carried out only by sprinkling gravel. During weekends and public holidays, the Bachledka Ski & Sun resort and the Treetops walk are quite busy. To make your visit as convenient as possible, we have prepared some information on how to plan your trip. The sooner you go, the nearer to the treetop walk you park. There is a parking lot P1 and P2 directly in Bachledova Dolina. The capacity is, however, limited to about 1,000 cars. During the weekends and holidays the parking lots are filled with cars during the first hour after opening. In that case cars are diverted to different parking lots. Follow the instructions of the parking staff and the police and park on the first spot they guide you to. All our employees have high-visibility clothing with our logo (other people in high-visibility clothing are not our staff and own private parking spaces). 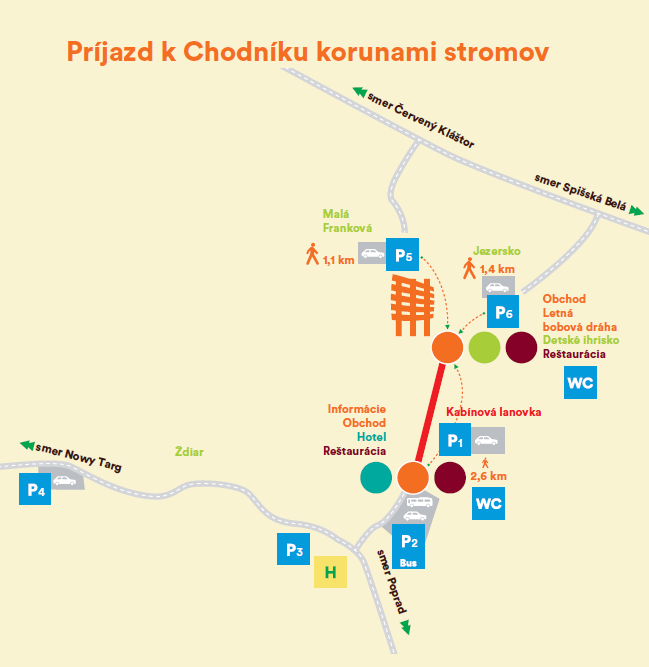 Our other parking lot P3 is located on the road to Ždiar on the left side, about 2 km from the resort. There are shuttle buses between Strednica to Bachledka – SKIBUS every 20-30 minutes. The parking lot P4 in the area of Strednica at the end of Ždiar is not currently under our operation. Coming from the side of Pieniny and Zamagurie and want to avoid traffic jams? Drive to smaller parking lots P5 below Malá Franková slope (turn at a church in the middle of the village) or to the P6 parking lot in Jezersko. From Jezersko there is a chairlift and from the Malá Franková a ski lift, non-skiers are only allowed to walk outside the ski slopes. SAD (Slovak bus operator) on the line Poprad – Ždiar stops at Bachledova Dolina. The stop „Bachledova dolina rázcestie“ is less than one kilometer from the resort. Check your bus connections at www.cp.sk. If you are on holiday in Ždiar or Jezersko, leave your car where it is and use our shuttle service – SKIBUS Bachledka. Skibus from Ždiar and parking lots goes through the village about every 20 minutes and stops for people skis walking along the way. Skibus from Jezersko runs along the main road through the village about every 30 minutes, stops for people skis walking along the way. Keep in mind that you need an electronic toll sticker on highways and express roads! More info. The resort is located in a protected nature zone, where the roads cannot be sprinkled by salt in the winter. All access roads are shoveled and sprinkled with stones. Weather in the mountains is changing rapidly, in the case of snow or ice, we recommend that you use snow chains. Due to the fact that during winter the walking footpaths are not shoveled or groomed and the passage through the slope is not possible, we recommend using the new chairlift from Bachledova Valley. The chairlift is safe, comfortable and fast. It can easily transport small children, dogs or seniors.